It starts with the uniform. The Miami Heat formally unveiled its “Vice Nights” City Edition uniform. Vice Nights is the sequel to last season’s enormously successful Vice campaign. 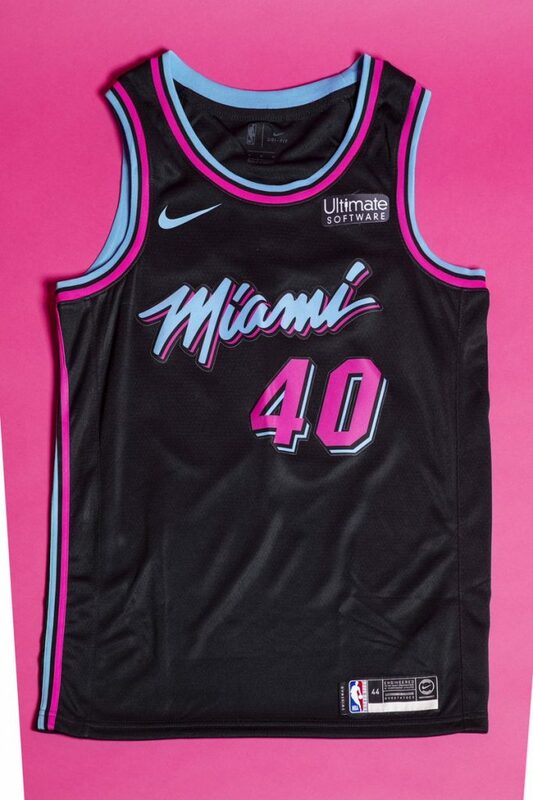 The Vice Nights uniform is black with the classic Heat silhouette from 1988 colored in laser fuchsia and blue gale and features the original Miami Arena script across the chest and a reimagined Heat ball and flame logo sporting the Vice Nights color combination. The uniform was designed in-house by Miami Heat Graphic Designer, Brett Maurer, and inspired by Heat history and the city of Miami in the 1980s. Maurer’s design was arguably the best City Edition uniform in the NBA last season. However, the availability for fans was at a high demand. There were instances after season end where fans waited to receive back ordered jerseys until the summer. Nike and the Heat admit the unexpectedly high demand for Vice jerseys last season and deliveries were delayed. They learned their lesson. With the expectation of getting your hands on Vice campaign swag, The Heat will debut the new look Friday when it takes on the Pacers at AmericanAirlines Arena. Miami is scheduled to wear the new Vice uniforms in 15 games this season — Friday vs. Pacers, Saturday vs. Wizards, Monday vs. 76ers, Nov. 18 vs. Lakers, Nov. 20 vs. Nets, Nov. 27 vs. Hawks, Nov. 30 vs. Pelicans, Dec. 2 vs. Jazz, Dec. 4 vs. Magic, Dec. 20 vs. Rockets, Dec. 22 vs. Bucks, Feb. 23 vs. Pistons, Feb. 25 vs. Suns, Feb. 27 vs. Warriors, and April 7 at Raptors. Expect the jersey of Dwyane Wade to be in high demand. The 13-time NBA all-star and three-time NBA Champion is expected to retire at the end of the season. The Heat is holding a Midnight Madness event at AmericanAirlines Arena, which is set to begin at 12:01 a.m. on Friday. Fans at the event will have a chance to be the first to purchase “Vice Nights” merchandise, including jerseys, and to experience other surprise “Vice Nights” activities happening exclusively at the arena. The swag was so last season. This season, the team will be playing on the new “Vice Basketball Court.” And like the uniforms before it, the court includes elements from the original design of the Miami Arena from 1988. The Miami script and double-stroke motif are the die-hards, the court as a whole is for the history books. The Heat have played on one court design since the AmericanAirlines Arena existed. This is colossal moreover flat out brilliant and nostalgic at the same time. The team has launched a website,http://Heat.com/ViceNights to showcase this season’s Vice campaign illustrating digital elements of the campaign including photography, video, upcoming promotions and activities and much more.